Maw-pemita’jik Qalipu’k is a monthly newsletter. In it, we aim to share not only the happenings of the Band but also, to help connect our dispersed communities. If you would like to share your thoughts on the newsletter content, or share an upcoming community event, achievement, news item, or anything else that may be of interest to our aboriginal community, please get in touch. Looking out the window of my office today one would think the spring thaw had arrived. We certainly have to be open to change living in a province like this; tomorrow we can expect below zero temperatures again. I encourage all of you to keep an eye on the ever changing forecast, and drive with caution in our communities and on the highways. Before I look back on the month that has passed since my last message, I want to point out an exciting event coming up in the near future, Qalipu’s annual aboriginal business forum, Mawio’mi 2016. This year it will be held in Corner Brook, March 9-10 at the Glynmill Inn. I’m told the lineup will include guest speakers from major development projects in the province, there will be many aboriginal businesses in attendance, and I’m pleased to note that Corner Brook MHA Gerry Byrne will bring greetings on behalf of the Honourable Dwight Ball, Premier of Newfoundland and Labrador and Minister of Labrador and Aboriginal Affairs. You will find more information about this event in the attached newsletter, including a link to register. One of the most meaningful events for me since my last message was participating in four of the five Faceless Dolls Remembrance Ceremonies held to date to honor missing and murdered women and children of our province. Events were held in several of our communities this month organized by the Newfoundland Aboriginal Women’s Network (NAWN). The first of the events was launched in Stephenville (co-hosted by Melgignat Women’s Group). I also had the opportunity to attend the community events in St. George’s (co-hosted by the Indian Cove Women’s Circle), in Corner Brook (co-hosted by the Corner Brook Aboriginal Women’s Association) and in Benoit’s Cove (co-hosted by the Benoit’s Cove Native Women’s Group). If I wasn’t able to make it to your community know that I was with you in spirt. I commend NAWN and all the participating women’s groups of the province on a tremendous job commemorating the missing and murdered women and children of Newfoundland and Labrador. The events I attended were truly touching. If you haven’t had a chance to attend one of these events I will point out that there are still three remaining: The Exploits Native Women’s Association will co-host an event in Grand Falls at the Friendly 50 Plus Club on at 3:00 PM February 20th, another will be held in St. John’s at the Native Friendship Centre on the 21st at 6:00 PM and finally the Norpen Women’s Group will co-host in Port Saunders Community Centre on March 13th at 12:00 PM. Since my last message we have also seen the beginning of the first round of town hall meetings with Ward Councilors. The meeting recently held in Stephenville was well attended and I hope to see many of you out for the meeting in Corner Brook this coming Tuesday, February 23, at 7:00 PM in the Pepsi Centre, Meeting Room #2. All Councilors have been encouraged to schedule town hall meetings by the end of March. Finally, I will note what a pleasure it has been drumming and learning with the Strong Bear Men’s Group. If you’re living or visiting on the west coast, I encourage you to join us some evening for an uplifting and positive experience. We currently meet most Tuesday nights at the Aboriginal Room, Grenfell Campus. I trust that each of you is withstanding the cold January weather, and finding ways to enjoy this time of year when it is often difficult to travel and get outside. It has been a busy start to the New Year at Qalipu. On January 9th we held our first regular meeting of Council and, we are already planning for the next. Initially we agreed to move from four meetings per year, to six. However, with the work we have before us it looks like we will surpass that goal. Each and every member of the Council has a strong voice at the table and hopes to accomplish much on behalf of members and communities within their Wards. Similarily, Council has committed to holding more regular town hall meetings in our nine Wards, with a minimum of two per year anticipated. I’d like to take the opportunity to bring your attention to two town hall meetings that are currently scheduled. Councilor Gerard Alexander welcomes members of the Stephenville Ward on January 24 at 2:00 PM in the lecture hall of the main building of the College of the North Atlantic. Councilor Brian Dicks welcomes members of the Corner Brook Ward to join him at the Corner Brook Civic Centre, Meeting Room 2, on February 23 at 7:00 PM. I intend to participate in these meetings and hope to meet with some of you there. Any time I hear about meetings and events happening in the Qalipu community I will try my best to be there, and share those moments with you. One of the most significant moments for me this month was attending a presentation by the National Truth and Reconciliation Committee related to Residential Schools in Canada. Hearing the report from the members of that committee, and the stories that came about, was very emotional and eye opening. I pray that the Committee’s 94 recommendations will be met with serious concern by our new government and I invite all of you to pray for this with me. Finally, I know that many of you are waiting for an update on the Enrolment process. This month I attended three days of meetings with the Enrolment Implementation Committee. An update on the enrolment process is expected to be available shortly. Below this message you will find a link to Qalipu’s monthly newsletter, Maw-pemita’jik Qalipu’k. I encourage you to read it and, stay in touch. Merry Christmas to all and a sincere wish for a healthy 2015. This past year has been a very busy year for Qalipu and we view it as a successful one. As seen at our Annual General Meeting in Corner Brook, members appear to be pleased with the service they are receiving. To date we have had an incredibly productive and exciting year in our Education and Training division so far this past year we have supported over 1,060 clients in education, training and employment opportunities. We have taken steps in 2014 to ensure that even more members receive support in the future by focusing our funding dollars beginning in 2015, specifically on tuition and books. In 2014, we launched our new Strategic Partnership Office to provide leadership in managing the Band’s partnering activities. This office is dedicated to developing partnerships to aid both our Band and its members. We continue to work hard to create opportunities for our membership to develop their careers and themselves and we look forward to 2015. In operations we have hired a new Director, we take this opportunity to welcome Robert Dicks to our team. As part of continuous improvement to serve Qalipu members, we will begin processing medical transportation claims at the Corner Brook office for the Central ward members only as of January 1, 2015. This is the beginning of a pilot project to hopefully administer all claims for medical transportation of Qalipu members. We will keep you informed as we take on other wards throughout the year. Our goal is to have all medical transportation claims of all members of all wards living in the Atlantic Canada processed by Qalipu. Membership cards of children that were registered when the band was first formed are beginning to reach an expiry date. Please view the information on Qalipu website, under Programs & Services, Status Indian Card section, Expiry of SCIS cards for children. In this past year the Community Economic Development department was renamed Service Qalipu. The new department combined the service delivery model for our economic and social programs under one roof, including Community Economic Development, Health and Social, Culture and Heritage, and Natural Resources. There has been considerable progress made in reaching the targets outlined in our Strategic Plan. The Band has placed much effort towards creating business opportunities for its members to capitalize on the Maritime Link Project. This was highlighted by the signing of a Socio-Economic Agreement with Emera in September. 2014 was a busy year with many cultural and resource projects including the documenting of our culture into an Aboriginal Traditional Knowledge Directory and completing an update to the 2002 Traditional Use Study. As a result of the excellent fundraising efforts of Qalipu staff, we were able to provide donations to the Diabetes Assoc., Janeway and ALS(Lou Gehrigs). Some Qalipu staff in the different regions will also be volunteering to assist different charitable groups during the Christmas season. Take the time to visit our website to see how you might be able to support the Band in helping the needy in our communities. Qalipu is here to serve you and we welcome any ideas that you have to offer. Have a safe an enjoyable Christmas and a Happy New Year. Chief Sheppard wishes to advise the youth members of Qalipu that the Provincial Government is currently seeking applications from youth interested in serving on the Youth Advisory Committee. This committee’s mandate is to identify and discuss key issues facing the youth of the province and to provide advice to the Minister on Government’s youth related programs, policies and services. Please see the following information and application which must be submitted by November 30, 2014. It is now evident that the letters, which members and applicants were advised through the Qalipu website in July 2013 would be coming, are now being received. As anticipated, these letters are causing concern among many individuals. We have posted as much helpful information that we could anticipate would respond to various questions under the Enrolment tab of Qalipu’s website site under the Latest News section. I sympathize with the difficulties and frustrations that you are experiencing; this process is complicated, as legal processes tend to be. In an effort to provide a level of comfort to members and applicants, I will provide a few scenarios that I hope will help explain the process and your next steps. It is important to note that these scenarios are of a general nature; differing circumstances may significantly change the approach required. In these scenarios, ‘Mi’kmaq community’ refers to one of the geographic locations of the Mi’kmaq Group of Indians of Newfoundland listed in Annex ‘B’ to the 2008 Agreement for the Recognition of the Qalipu Mi’kmaq Band. Ted applied for membership before the band was created on September 22, 2011, and he lived in a Mi’kmaq community at that time. When Ted applied, steps in the application led him to provide a piece(s) of identification as proof that he was living in a Mi’kmaq community. If Ted provided this proof of residency at that time, and if he was still living at the same address on the day the band was formed (September 22, 2011) or did not provide evidence that he is no longer living in a Mi’kmaq community, then he does not need to do anything further to maintain his membership. In other words, Ted would not need to submit any additional documents in support of his application. Tony applied for membership before the band was created on September 22, 2011, and he lived outside a Mi’kmaq community at that time. When Tony applied, steps in the application led him to provide proof of acceptance by one of the Mi’kmaq Groups of Indians of Newfoundland. However, like the majority of applicants that lived outside a Mi’kmaq community, Tony provided very brief affidavits for proof of acceptance. These affidavits do not provide adequate evidence. While Tony has met the Self-Identification criterion by signing the application prior to the band creation date, he still has to provide evidence to fulfill the criterion of group acceptance by one of the Mi’kmaq Groups of Indians of Newfoundland. Rose applied for membership after the band was created on September 22, 2011 and she lived outside a Mi’kmaq community at that time. 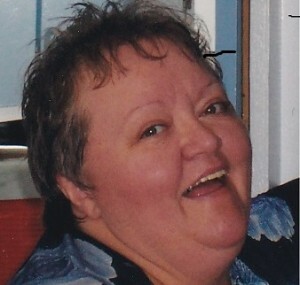 When Rose applied, she assumed that signing the application would fulfill the requirement of Self-Identification, but as 4.1 (d) (i) of the Agreement indicates, Rose had to self-identify as a member of one of the Mi’kmaq Groups of Indians of Newfoundland on the date of the Recognition Order (September 22, 2011). Because Rose applied after the band was created, she must provide proof of Self-Identification. Also, when Rose applied, steps in the application led her to provide proof of acceptance by one of the Mi’kmaq Groups of Indians of Newfoundland. However, like the majority of applicants that lived outside of a Mi’kmaq community, Rose provided very brief affidavits for proof of the acceptance. These affidavits do not provide adequate evidence. Therefore, Rose must now also provide evidence of acceptance by one of the Mi’kmaq Groups of Indians of Newfoundland. Janet applied for membership after the band was created on September 22, 2011, and she lived in a Mi’kmaq community at that time. When Janet applied, she thought that signing the application would fulfill the requirement for Self-Identification, but as 4.1 (d) (i) of the Agreement indicates, Janet must have self-identified as a member of one of the Mi’kmaq Groups of Indians of Newfoundland on the date of the Recognition Order (September 22, 2011). Because Janet applied after the band was created, she must now provide proof of Self-Identification. When Janet applied, steps in the application led her to provide a piece(s) of identification as proof of residency that she was living in a Mi’kmaq community. If Janet provided this proof of residency, and was still living at the same address on the day the band was formed (September 22, 2011) or did not provide evidence that she is no longer living in a Mi’kmaq community, then she does not need to provide any further information to fulfill the criterion of acceptance by one of the Mi’kmaq Groups of Indians of Newfoundland. I feel it is necessary to state again that the review process will be in line with the original agreement and that all current members will retain their status cards (and eligibility for benefits that are conferred to registered Indians) until a decision is reached at the end of the review process, which is expected to be March 2016. At the end of the process, if children are denied membership and their parents maintain or gain status, applications for Indian registration under the Indian Act may be made on behalf of the children directly to the Office of the Indian Registrar at Department of Indian Affairs and Northern Development. Members, as you are all aware, the end date for submitting additional documentation to support applications for enrolment into the Qalipu Mi’kmaq First Nation Band was February 10, 2014. The process at the Winnipeg unit will begin to match all the information which was provided by applicants to specific individual files. Now that this stage of the process is over, Qalipu will focus on developing partnerships with different levels of governments, industry and business to create as much opportunity as possible for employment and training requirements of the Qalipu membership. A couple of initiatives on-going are; the negotiation of a Social Economic Agreement with Nova Scotia Power, to work cooperatively with Qalipu to ensure meaningful Qalipu participation in the construction of the Maritime Link, which is a new electrical power transmission system between the Island of Newfoundland and Cape Breton, Nova Scotia. 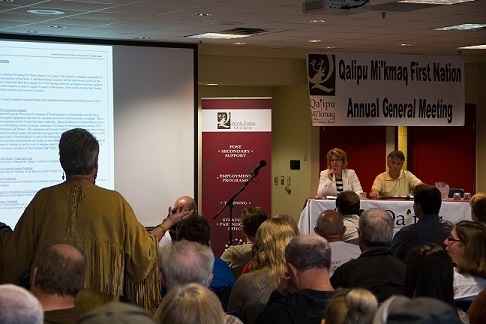 Currently Qalipu has a project to provide expansion of 1999 FNI-Traditional Land Use Report. The information being collected under this initiative will mainly focus on capturing data from the communities of Burgeo and St. George’s, in the area of the Maritime Link Project. Qalipu is proud to say that we have created a separate legal entity, the Qalipu Mi’kmaq First Nation Cultural Foundation. The Cultural Foundation will be responsible for preserving and promoting the culture, language, and traditions of the Qalipu Mi’kmaq people of Newfoundland and Labrador. It intends to identify Band members who have a commitment to preserving and promoting culture and heritage and to designate cultural ambassadors. It will be responsible for ensuring cultural documentation and promoting the involvement of youth and Elders in cultural activities within the Band. The above examples are all part of Qalipu’s Strategic Plan which is a critical part of good governance and sound management. The Chief and Council of QMFN, through the Strategic Planning and Governance Committee, created a planning model that incorporates multi-year activity with on-going evaluation and annual plan updates. As per my earlier message the deadline to submit documentation to the Enrolment Office in Winnipeg has been extended to February 10, 2014. If you are submitting any additional documentation to your membership file it must be, date stamped by Canada Post or a courier service by February 10, 2014. Also, Qalipu will continue to search FNI membership lists until February 10, 2014. However; please be mindful that if you wait to request a search on the final day, February 10, 2014, there is a real chance you will not receive the results from the requested search to meet the deadline. Therefore, I encourage individuals who were a member of one of the FNI local bands or FNI General Membership list prior to 2008 to call 709-634-0996, then press # (pound), extension numbers 209 or 214 or email fni-info@qalipu.ca to have a search conducted. If your name appears on either of the lists, we have in our possession, a letter can be provided. However, letters will only be given out if we have a band list that can be referenced containing your name. I cannot promise that we have all of the lists from all of the FNI local bands since the organization began. Happy New Year to all, it’s my hope that everybody will have a year filled with good health and that good health will be with each of you for many years to come. First of all, I extend a sincere thank you to so many people who have called/ emailed to say thank you for my message that contained a number of scenarios. I am very pleased that the scenarios have helped some people to clarify the letter they have received from Ronald Penney(Enrolment Committee Chair). Unfortunately, there are many who are not certain of what they should provide and I realize that the scenarios do not take away the stress of how you will meet the requirements. It has come to my attention that there are people who were members of the Federation of Newfoundland Indians (member of one of the FNI local affiliate bands) prior to 2008 who thought they were still on the 2008 membership list and have discovered for some reason they are not on the list when they call for verification at the 1-800-567-9604. This piece of information is extremely important for individuals that need to meet the requirement of Self Identification and or substantial connection. For that reason Qalipu has hired two individuals until January 31, 2014 to search old FNI membership lists. Individuals who were a member of one of the FNI local bands or FNI General membership list prior to 2008 can call 709-634-0996, then press #(pound), Extension Numbers, 209 or 214 or email fni-info@qalipu.ca to have a search conducted. If your name appears on either of the lists a letter can be provided. However; letters will only be given out if we have a band list that can be referenced containing your name. I cannot promise that we have all of the lists from all of the FNI local bands since the organization began. Letters issued after June 23, 2008 from a local band council will not be accepted. It is important to note that not everyone will require a letter verifying their membership. Please review the scenarios of my previous message to determine if you need to meet self-identification and or substantial connection prior to requesting a search. The Federation of Newfoundland Indians has reached a Supplemental Agreement with the Government of Canada that will allow a fair and equitable review of all valid applications. I realize and understand that many people have questions about how and when the process of reviewing the remaining applications for membership in the Qalipu Mi’kmaq First Nation Band will be concluded by the Federation of Newfoundland Indians and the Government of Canada. We are hoping that the negotiations about the review process will be concluded and approved soon. As the parties move forward I will post more information regarding next steps on our website. Again I can only ask for your patience to allow the time that is necessary to get these discussions concluded. Unfortunately I’m not able to give you an update that we, Canada and the Federation of Newfoundland Indians (FNI), have an agreement to continue the enrollment process as of today however; we are meeting regularly to address the issues that have arisen in the enrolment process, including the unexpectedly large number of applications received and the fact that the deadline for dealing with applications has expired. The original intent of the 2008 Agreement for the Recognition of the Qalipu Mi’kmaq Band was to recognize the Mi’kmaq group of Indians of Newfoundland. This Agreement brought resolution to a court case initiated in 1989 by the Federation of Newfoundland Indians, which represented approximately 7,800 members at the time, seeking eligibility for registration under the Indian Act. When the agreement was signed, both Canada and FNI estimated that the First Nation would be comprised of approximately 8,700 to 12,000 members. It was neither reasonable nor credible to expect more than 100,000 applications to be members of the Qalipu band, given the numbers of individuals who identified themselves as members of the Mi’kmaq group of Indians of Newfoundland when the agreement was signed. In fact, according to the 2006 Census, there were approximately 23,450 residents of Newfoundland and Labrador who identified themselves as Aboriginal. Furthermore, it has become clear that the majority of the more than 100,000 applicants appear to no longer reside in those communities. In fact, FNI and Canada estimate that almost 70 per cent of the applicants do not reside in any of the Mi’kmaq communities targeted for recognition in this initiative, but elsewhere in Canada. The goal of the current discussions is to find a solution that will treat everyone fairly and equally. At the same time, it is necessary to arrive at a solution that ensures integrity and fairness in the enrollment process and reflects the original intention of the parties. We know that many people have applied in good faith, and wish to be advised of what is happening. The parties hope to be able to arrive at an agreement soon and provide further details. Please be assured that all applications received during the Enrolment Process are and will continue to be stored in access-controlled and secure location. The information provided is protected under, and will be treated in accordance with, the Privacy Act and the Access to Information Act. As mentioned in the January 2013 update on the enrolment process, the FNI implementation committee held several meetings with Mr. Fred Caron and officials of Indian Affairs and Northern Development Canada. Both parties met on February 08/13 and are scheduled to meet again on February 18th and 19th to continue discussions on reaching an acceptable resolution regarding the overwhelming number of applications that were not reviewed up to the end of the review process as outlined in the agreement. There is no decision reached at this time and the only information to report on is that further discussions are scheduled to continue with the best intentions of reaching an acceptable process to deal with all remaining applications. Due to the fact, that no candidate offered themselves for councilor of the Gander Bay Ward during the Qalipu election in the fall of 2012. Qalipu will hold a by-election in this area on March 27th 2013. The successful candidate will be required to attend four council meetings in each fiscal year. The cost of attending council meetings are fully covered by Qalipu, for example travel rate at .53 cents per kilometer, full day meal allowance $71.30, incidental 17.30, hotel accommodation covered or private accommodation at $50.00, if required to overnight, $100 per diem per meeting and a yearly honorarium of $5,000.00. Therefore; we are asking all members of QMFN in the Gander Bay Ward to visit www.qalipu.ca and update member information into the GINU membership database. Remember, use the Already logged in section if you have previously logged in. For members who have not logged in before you must enter a zero in front of your band registration number. Please provide current email address, street address and mailing address. As you may be aware QMFN has incorporated a mail in ballot option for the election process and without the correct mailing address we will not be able to provide you with this feature. Qalipu can also notify members of election details through an email if members register an email address in the GINU membership database. It is critically important that you continuously manage your own member profiles on our database. I urge you to actively keep your information up to date. As you can imagine with such a large membership, we need you to take responsibility for making sure your information is up to date in order for us to provide you with update information. Qalipu was saddened to hear that Ben White, a former Chief of the Indian Head Band Council in Stephenville and a good friend passed away on January 27th, 2013. Ben as he was known by all was a very sincere and strong supporter of the aboriginal movement here in our province. Ben served on the Federation of Newfoundland Indians board of directors for many years and was well respected for his contribution and guidance as an Elder at the FNI board table. Even though his health was causing him problems he always made a call to me from time to time to check on certain things and to pass on words of encouragement as well as to ask about others who were on the board of directors during his time as Chief. Ben will be sadly missed by all who knew him, our most sincere condolences to his wife Barb and family. Here is a link to Ben’s obituary. There is no great change to the information which was provided in my earlier update on the enrolment process other than the fact that the timeline for the review of applications in the second stage has concluded as of December 31, 2012. The enrolment committee is now doing the work which is required of them as per the agreement. The agreement between the Federation of Newfoundland Indians (FNI) and the Government of Canada, for the recognition of the Qalipu Mi’kmaq First Nation Band (QMFB) is still at this point in time, scheduled to end March, 2013. The submission date for applications under the enrolment process ended November 30th 2012. There was in excess of 100,000 applications received for the entire process. As mentioned in the previous update, I wrote Minister John Duncan and requested an extension to the agreement in order to have all applications that were received as of November 30th 2012 reviewed. While the Minister has yet to agree to my request for an extension, he has appointed Mr. Fred Caron as a special representative to advise him on how to deal with the remaining applications. The implementation committee representing Qalipu has had several meetings with Mr. Fred Caron and his colleagues from Aboriginal Affairs and Northern Development Canada in respect to addressing this issue and two other meetings are currently scheduled, one for January 18th and the other for January 31st. To date no decision has been made however both teams are sincerely working towards establishing a resolve to this issue and until a decision is made there is nothing more I can provide in the way of information. Merry Christmas to each of you and a wish for a healthy 2013. Qalipu Mi’kmaq First Nation Band held its very first meeting with the newly elected counselors on December 10th and 11th 2012. The first day began with a meet and greet breakfast for counselors and all Qalipu staff, this session was important to give counselors and staff an opportunity to get to know each other. All counselors were in attendance and the Oath of Office was taken by each. Council was updated on the current initiatives within QMFN by a number of consultants involved in the different projects as well as presentations from Qalipu’s managers of programs. A couple of weeks prior to the council meeting counselors were provided with all related policies and procedures of Qalipu as well as the minutes of the last meeting of Qalipu’s interim council. It is evident to me that the new elected Qalipu council will be a pleasure to work with on behalf of all members. Qalipu Council has decided to hold a by-election in the Gander Bay ward prior to March 31, 2013. Mr. Wayne Green, who served as the Chief electoral officer during the recent Qalipu election has advised Qalipu that he is now gone into full retirement and will not be available to serve as Chief Electoral Officer for Qalipu. The agreement between the Federation of Newfoundland Indians (FNI) and the Government of Canada for the recognition of the Qalipu Mi’kmaq First Nation Band (QMFNB) is currently scheduled to end March 21st, 2013. The submission date for applications under the enrolment process ended November 30th 2012 and the review process of these applications is scheduled to end December 30th, 2012, with other necessary work associated with this process to be completed as of March 21, 2013. As previously mentioned in media interviews over the past year, the number of applications received has surpassed everyone’s expectations. During the second stage of the enrollment process over 70,000 applications were received, bringing the overall total for both the first and second stage to over 100,000 applications. When it became apparent that all these applications could not be reviewed in the time frame outlined in the agreement, I wrote Minister John Duncan and requested an extension to the agreement to allow for the review of all applications that were received as of November 30th 2012. While the Minister has yet to respond to my request for an extension, FNI and AANDC have agreed to work together to discuss next steps. To that end, Minister Duncan appointed Mr. Fred Caron as a special representative to work with the leadership of the QMFNB on an approach to address the situation and advise him on how to deal with the remaining applications. The implementation committee representing QMFNB has had several meetings with Mr. Caron and his colleagues from Aboriginal Affairs and Northern Development Canada to address this issue and further discussions are scheduled. Both parties are making a sincere effort to reach a reasonable resolution that will provide for an assessment and review of all remaining applications. Given the ongoing nature of these discussions it is not possible to predict, at this time, what will be the result of the discussions or when a final decision will be made. Enrolment offices will be closed effectively January 04, 2013 and the enrolment committee will not be answering any calls or emails they will contact an applicant if the need arises. I take this opportunity to sincerely thank all of you who supported me for the Chief’s position in Qalipu Mi’kmaq First Nation Band’s historic election. I am very pleased to have such an honorable position bestowed upon me. On behalf of Qalipu elected council members, I also extend a thank you to all Qalipu members who exercised their right to vote in this very important first election for Chief and council. Programs being implemented by Qalipu Mi’kmaq First Nation Band (QMFN) on behalf of its members, such as Post-Secondary Education (PSE), is not a right as some members believe it to be. QMFN receives a certain amount of funding from Aboroginal Affairs and Northern Development Canada (AANDC) to assist members with their PSE. QMFN can only approve applications based on the amount of funding received. There is no doubt with such a huge membership within Qalipu, there will be applicants who will not receive approval for funding and that has to be expected unless there was an endless amount of funding for this program. In light of the enormous response to this program, the only fair process available in determining application approval is to deal with completed applications on a first- come- first- serve basis with all applications being date stamped. Qalipu sympathizes with those applicants who did not receive funding approval for this fiscal year. We would like to have sufficient funding to deal with each and every applicant, unfortunately the budget for PSE from AANDC does not allow for such consideration. Please understand that we at Qalipu are doing our utmost to be fair and equitable as possible to all members we represent. Amendment to the Order in Council under the Accelerated Process. As Chief of the Qalipu Mi’kmaq First Nation (QMFN) I am happy to report that the final amendment to the Order in Council (OIC) under the accelerated process to deal with all eligible applications submitted for status recognition with QMFN in November 30, 2009 has been pass on June 19, 2012. The amendment included 933 individuals to be added to the founding members list in the first stage of the enrollment process. All 933 individuals will be receiving a temporary confirmation of their registration from Aboriginal Affairs and Northern Development within the near future. It was a shock along with the greatest degree of sadness for the Qalipu Mi’kmaq First Nation Band and the many many people who knew Tony John of Glenwood NL, when we were advised of his sudden passing, while he was away from home working in Fort McMurray. Tony John was one of the original founders of the Native Association of Newfoundland and Labrador which eventually evolved into the Federation of Newfoundland Indians. Tony was attending university at the time the aboriginal movement began in Canada, which quickly caught on here in this province. 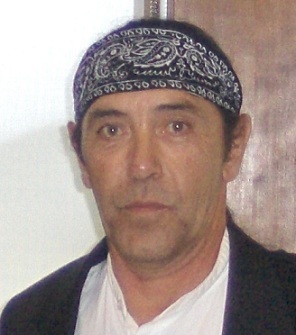 Since the establishment of the Aboriginal Provincial Organization, Tony held several key positions such vice president, president, board member and Chief of the Glenwood Mi’kmaq First Nation and held these positions with the greatest consideration and respect for the Mi’kmaq living on the island portion of this province. Tony was a great friend and a strong supporter of the landless band concept which would establish official recognition for the Mi’kmaq people whom he advocated for since his involvement. On June 09th 2006 Tony announce to the FNI executive and board of directors that he was resigning as Chief of the Glenwood Mi’kmaq First Nation Band and that even though he was bowing out of aboriginal politics he would always be there for us and that we could call upon him at any time. When the Prime Minister of Canada came to St. George’s in November of 2007 to witness the signing of the agreement –in-principle, Tony was invited to the signing ceremony. Tony accepted the invitation without any hesitation and was very happy to attend. On the day of the ceremony Tony was sitting in a front row seat with a very notable smile of pride and contentment that the goal and objective of the FNI which he was instrumental in starting many decades ago was finally becoming a reality. Tony’s commitment and dedication to the Mi’kmaq movement in this province will remain a legacy and will never be forgotten. Tony was a true friend, one who never went behind your back if he had something to get off his chest. Tony was an up-front person who made his position known regardless of who you were or what position you held. Tony and I didn’t always agree in meetings and sometimes strong words of disagreement were expressed but after the meeting was over Tony was the same friend as if the disagreement had not happened, an excellent quality, a true value of a Mi’kmaq person. On behalf of the Federation of Newfoundland Indians and the Qalipu Mi’kmaq First Nation, I express our deepest sympathy and offer our sincere condolences to Tony’s mother, his daughter Toni Marie, his two grandsons and all members of his family. Dear members and potential members, as you are aware the band was just recently established in September 2011 and has many challenges to deal with in order to build a firm foundation for the future. I realize that the process of reaching a staff person within Qalipu for any type of assistance either through phone calls ,emails and letters etc is frustrating, however please understand that there is a huge demand for service at this time. There are thousands of individuals seeking information related to their Mi’kmaq ancestry, requesting information on their applications, on their status cards, on their medical prescriptions, dental, along with hundreds of visits to our offices, individuals looking for applications and seeking all types of information, making it very difficult for a staff member to be readily available at the ring of a phone. At this stage in the transition QMFN is incorporating new accountability systems which have placed a huge demand on staff time. However; all of these efforts are necessary to provide service and accountability to the large dispersed membership. Qalipu is now dealing with approximately forty thousand applicants as opposed to eighty-six hundred during the period of time when the Federation of Newfoundland Indians was lobbying for recognition. I trust you will understand there are many agenda items that need attention during this time and they all cannot be addressed at once however; they will be dealt with as best we can during our infancy stage. To assist each of you, we have recently updated our contact list so that you can hopefully reach the appropriate person when trying to make contact with QMFN. In closing, I ask all to remain patient and provide Qalipu sufficient time to deal with all the important matters which need to be completed. October 08, 2014 – Corner Brook, NL – The Qalipu Mi’kmaq First Nation Band (QMFNB) is pleased to announce the finalization of a Socio-Economic Agreement for the Maritime Link Project. This agreement builds on the positive relationship that has developed with Emera Newfoundland and Labrador over the past two years. The agreement includes provisions to follow through on commitments made during the federal Environmental Assessment process to consider current use of land and resources for traditional purposes and monitoring of potential interactions, as well as promote training, employment and business opportunities for members of Newfoundland’s Qalipu Mi’kmaq. Qalipu Mi’kmaq First Nations Band is encouraging all members to update their profiles in the GINU database, to ensure access to opportunities associated with the Maritime Link. Emera Newfoundland & Labrador is designing, constructing and will own the 500 MW +/- 200kV Maritime Link Project. This is a high voltage direct current (HVDC) transmission electric project that will connect the island of Newfoundland and Nova Scotia for the first time. The project includes two 170 kilometre subsea cables and approximately 400 kilometres of overhead transmission line. Qalipu will be accepting donations at each office through-out the month of December. For more details on items accepted, please contact your local Qalipu Office. Help us raise some funds and help those in need this holiday season. Tax receipts are available for monetary donations to organizations with charitable status. Majestic Premises located at 1 Church Street, Corner Brook, NL has office space for rent. Pricing can be on a month-to-month basis or lease term, the rental space can be with or without internet access, furnished or not furnished, 95% of the offices in this building have a window, the building has central air conditioning and heating, secured space, entire space is newly renovated with ceramic tile flooring and a kitchen area for use by tenants. Visit our website at http://qalipu.ca/qalipu-development-corporation/. A nice space, 16 X 36, for continued community events is available. Heat and lights are included in all monthly prices. Space overlooks the Majestic lawn in the town site area of the city. Professional service tenants renting the ground level space. The space is not wheel chair accessible. *HST is applicable to all prices. * Furnished means a desk, chair and File cabinet. To view pictures click here. Call Mabel MacDonald at 634-5111 for further information. demonstrates dedication to business growth? is committed to customer satisfaction? delivers quality products and services? is a strong supporter of their Mi’kmaq heritage? Nominations are currently being accepted for the Qalipu Business of the Year Award to be presented at the 2014 Corner Brook Business Excellence Awards during Small Business Week. Qalipu Mi’kmaq First Nation Band held our second Annual General Meeting in Corner Brook on July 6th, 2014. With over 135 Members in attendance, the meeting was informative with Work Force Qalipu and Service Qalipu presenting an overview of their program activities. The Finance Department presented the Consolidated Financial Statements for the Fiscal year 2014. Members were given the opportunity to ask questions relating to activities of Qalipu and the Enrolment process. Questions that were asked related to the topic of Secure Cards, Education & Training, Finances, Taxation, Culture and Non Insured Health Benefits, and Enrolment. You can view a copy of the Annual Report here and a copy of the Consolidated Financial Statements here. Bernie as she was known to staff, Board of Directors of the FNI and Council of the Qalipu Mi’kmaq First Nation was employed with the organizations from July 6, 1996 to April 2012 when she had to finish working due to her illness. Bernie worked out of the Grand Falls-Windsor office as a Client Relationship Officer. Over the course of her employment she assisted in excess of a thousand students work their way through post-secondary education. It was truly a blessing to have worked with Bernie as she was a great lady and a good friend to all that had contact with her. Bernie was a very dedicated employee/co-worker, who always gave 100% to the best of her ability. Bernie always went above and beyond for many of her students and tried to help in any way possible. In addition to her great work ethics, Bernie continuously gave to others, she was known to provide many baked treats and meals to co-workers, community group functions and board of directors, these actions cannot help but touch the hearts of all. Bernie struggled with her health for a very long time, however; her dedication to the organization didn’t stop. There are many stories that we could relay of Bernie calling the offices trying to help clients from her hospital bed. She will truly be missed by all at Qalipu. Our condolences certainly are extended to both of her children, Cassie and John, her grand-children, her sisters Margaret, Barbara and Christine, and her brother Gerald. May the memories of her good will for everyone, help you in the days of mourning. God Bless. Each year the Qalipu Mi’kmaq First Nation Band raises money for select Charities of Choice as a way to give back to the community. Qalipu Staff chose the Canadian Diabetes Association as one of the Charities for 2013-2014. Staff from Qalipu office locations in Glenwood, Grand Falls-Windsor, Corner Brook, and St. George’s participated in this meaningful effort. 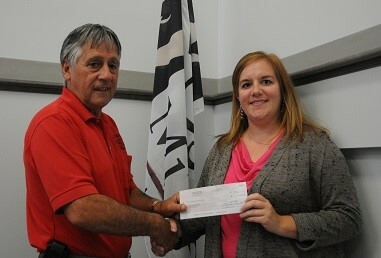 Fundraising consisted of summer weekly barbeques, recycling collection, potluck dinners, etc. Through the dedicated efforts of the Qalipu’s staff, a donation of $3000 was presented to Ms. Leanne Madore, a representative of the Canadian Diabetes Association from Western Health in Corner Brook, NL, by Chief Brendan Sheppard. The Qalipu Mi’kmaq First Nation Band would like to thank everyone who supported the fundraising events and a special thank you to the staff for making this donation to the Canadian Diabetes Association possible. Each year the Qalipu Mi’kmaq First Nation Band raises money for select Charities of Choice as a way to give back to the community. 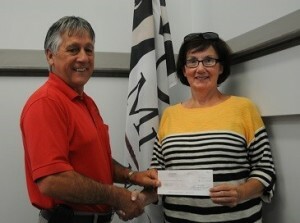 The Qalipu Band Council chose the ALS Society as one of the Charities for 2013-2014. This fundraiser was carried out by Qalipu staff at the request of council in addition to staff’s own fundraiser for the Canadian Diabetes Association. All of the profits from the sale of promotional items were donated to the ALS Society. These promotional items included Qalipu Mi’kmaq First Nation Band branded shirts, hats, flags, coasters, calendars, and tote bags. Qalipu staff have these items for sale at all four of our office locations in Glenwood, Grand Falls-Windsor, Corner Brook, and St. George’s. Qalipu’s staff was able to raise $1200 for the ALS Society. The donation was presented to Cheryl Power of the ALS Society of Newfoundland Labrador, by Chief Brendan Sheppard. The Qalipu Mi’kmaq First Nation Band would like to thank all those who purchased our promotional items which made it possible to give this donation to the ALS Society. The Qalipu Mi’kmaq First Nation Band is seeking members that are willing to share their knowledge in the following areas: Traditional knowledge of ceremony and traditions, knowledge of traditional medicines, artisans, tool makers, crafters, hunters, fishers, trappers, gatherers, traditional singers and drummers, traditional storytellers, historians and language knowledge. The Qalipu Mi’kmaq First Nation band will be hosting this event on August 26th – 27th, 2014 in Stephenville, NL. For more information click here. The Ulnooweg Development Group Inc. is hosting the 7th Atlantic Aboriginal Entrepreneur Awards Show in Membertou, Nova Scotia on September 16, 2014. We invite members to nominate Aboriginal Entrepreneurs for their achievements throughout the year. As entrepreneurs, these individuals and families play a vital role in building stronger Aboriginal communities for future generations. The deadline for nominations is August 22nd. Members of the Qalipu Mi’kmaq First Nation Band are invited to the second Annual General Meeting of the Band to discuss the activities of the Band for the fiscal year of 2013-2014. Copies of the Annual Report is available here and will also be available at the session. Please note that Membership Identification will be required. Sunday, July 6, 2014, 2:00 P.M. to 4:00 P.M.
We’ve been contacted by KKC to let our members know about an Ironworker Rebar Training opportunity. The deadline to apply is Monday, May 26, 2014. Kiewit-Kvaerner Contractors (KKC) has partnered with Ironworkers Education & Training Co. Inc. (Ironworkers Local 764) to offer a 5-week Ironworker rebar training program, which is customized to meet the Summer 2014 labour needs of the Hebron GBS Project. This program will prepare individuals for potential employment opportunities as apprentice rebar workers (rodpersons) on the Hebron GBS Project. The tuition costs will be fully subsidized by KKC and Ironworkers Local 764. Registration for the program is on a first-come-first-serve basis and is open to residents of Newfoundland and Labrador. No previous trades/industrial experience or training is required. However, it will be considered an asset. To register your interest in this training program by May 26th, please visit www.bullarmtrades.com and select “Rebar Training Program” – or – follow this link http://ch.tbe.taleo.net/CH03/ats/careers/requisition.jsp?org=WPLCA&cws=1&rid=48 and click “Apply for this Position”. Your contact information and resume will be provided to Ironworkers Education & Training Co. Inc. for screening and course registration purposes. Work Force Qalipu administers a number of education, training and employment initiatives. One of these initiatives is the Youth Summer Employment Program (YSEP). We are currently seeking application from organizations who are interested in our Youth Summer Employment Program (YSEP). Please apply as soon as possible but no later than 12:00 P.M. on Friday May 16th, 2014. For more information, please click Here. The Qalipu Mi’kmaq First Nation has been working closely with Emera NL on opportunities for members and member companies to participate in the Maritime Link Project. This project will include the construction of new transmission lines between Cape Ray and Bottom Brook along an existing transmission corridor, and from Bottom Brook to Granite Canal in a combination of existing and new corridors. The project will also include the construction of grounding facilities, converter stations, transition compounds and other potential infrastructure. Qalipu has developed partnership opportunities with contractors that have been selected or shortlisted to deliver the various components of this project. We are currently seeking interest from member-owned companies that are able to offer secondary products and services to these selected contractors. Identified services include, but are not limited to, the following: Excavation, Trucking, Health and Safety, Environmental Services, GIS/Surveying, Fencing, Wood Harvesting, Fuel Services, Equipment Maintenance, PPSE Supply, Electrical, Communications, Security, Fire protection, etc. We strongly encourage all members that are interested in providing products and services for the Maritime Link Project to register their company in the Qalipu Business Network. Please visit http://www.qbn.qalipu.ca/Registration to complete the online registration form or contact Nicole Companion at (709) 634-8043 or email ncompanion@qalipu.ca if you have questions or need further assistance. A time to reflect and be grateful to a man that has given so much of his life to the Mi’kmaq of Newfoundland. Wilson Samms, made fundamental contributions in the aboriginal movement in Newfoundland. Mr. Samms was the founder of the Benoit’s Cove Indian Band Council in the early 1970’s. It is because of the efforts of this man that today there is currently 2000 Mi’kmaq from the South Shore of the Bay of Islands recognized with the Qalipu Mi’kmaq First Nation Band. Mr. Samms was the Chief of the Benoit’s Cove Band for approximately twenty years. He continued representing the Mi’kmaq people as the Federation of Newfoundland Indians Honorary Chief for many years later. In is later years of life Mr. Samms was always eager to represent the Mi’kmaq people when called upon by the organization. Many of us remember how proud he was to be one of the people invited to the ceremony in St. Georges with many dignitaries including, Prime Minister Harper to witness the signing of the Agreement to form the Qalipu Mi’kmaq First Nation in 2007. From all of Mi’kmaq, especially in the Benoit’s Cove area and the Board of Directors of the Federation of Newfoundland Indians we express our sincere condolences to his family. The Qalipu Mi’kmaq First Nation Band and the RCMP are working together to build a worthwhile work experience for aboriginal youth who are interested in joining the RCMP. This exciting job opportunity will give you an insightful look at the RCMP and may help you decide if this is a worthwhile career opportunity you wish to pursue. This job opportunity is nine (9) weeks in duration from July-August 2014. For more information, click here. To download and complete the application form, click here. The deadline to submit applications has been extended until 4:00 P.M. on Friday February 28th, 2014. The Qalipu Mi’kmaq First Nation Band and the RCMP are working together to build a worthwhile work experience for aboriginal youth who are interested in joining the RCMP. This exciting job opportunity will give you an insightful look at the RCMP and may help you decide if this is a worthwhile career opportunity you wish to pursue. This job opportunity is nine (9) weeks in duration from July-August 2014. For more information, click here. To download and complete the application form, click here. Click here to readFAQs on Sworn Declarations and Affidavits. Click here for Aboriginal Affairs and Northern Development Canada Year- End Reporting Handbook. Councillor Barker, Exploits Ward, and Councillor Skeard, Glenwood Ward, in conjunction with the Central Vice Chief, Randy Drover, will be holding two (2) member meetings to discuss the letter that was recently mailed by the Department of Aboriginal Affairs and Northern Development Canada (AANDC) regarding the enrolment reassessment process. This meeting will focus on the letter from AANDC. Members will be given an overview of the letter and the associated requirements. This meeting is for current members of the Qalipu Mi’kmaq First Nation Band, and in particular the Exploits and Glenwood Wards. This notice is an update to the public notice of July 31, 2013. More information is now available on www.aandc.gc.ca/qalipu and www.qalipu.ca concerning the process for enrolment in the Qalipu Mi’kmaq First Nation and the implementation of the 2008 Agreement for the Recognition of the Qalipu Mi’kmaq Band and the 2013 Supplemental Agreement. Members of the Qalipu Mi’kmaq First Nation Band were invited to attend the first Annual General Meeting of the Band. The meeting was held at the Albatross Hotel in Gander, NL on Saturday October 26th, 2013. Copies of the Annual Report that were available at the session can be found here. Corner Brook Councillor Brendan Mitchell in conjunction with Benoit’s Cove Councillor Bern White are holding a Town Hall information session at the Royal Canadian Legion on October 30th at 7:00 P.M. This session will cover the topic of “Hydraulic Fracturing”. Guest Speakers include Mr. Graham Oliver and Dr. Ian Simpson. All Qalipu Mi’kmaq First Nation Band members from the Corner Brook and Benoit’s Cove Wards are encouraged to attend. Please note that members from other Wards are also welcome to attend. Members of the Qalipu Mi’kmaq First Nation Band are invited to attend the first Annual General Meeting of the Band. Copies of the Annual Report is available here and will also be available at the session. We are working hard to make sure we develop the best services and programs for you and all of our members. We are working now on updating our Qalipu Membership Database. This will help us build a database of current information on our members. It will provide current contact information for the election process as well as allow you to access training and employment programs, especially for members who are over 18 years of age. It is critically important that you continuously manage your own member profiles on our database. You are urged to actively keep your information up to date. As of now, we have more than 16,000 registered members over the age of 18 (of the almost 22,000 members in total); it is quite possible that this number will almost double in the next few years. As you can imagine with this large membership we need you to take responsibility for making sure your information is up to date in order for us to maintain communications with you. Through this database you can now access your individual member files. Please go to the home page of the site and click on the “Update Member Information” button and follow the instructions. STEPHENVILLE – The College of the North Atlantic Film and Video program is proud to announce the world premiere of a short film about famous Newfoundland frontiersman Mattie Mitchell. The film stars Mattie’s own great-grandson, Alonzo Rumbolt, in the title role. The short film chronicles Mitchell’s expedition as a hunting guide to Worcester, a down-and-out American reverend. When disaster strikes in the heart of the forest, Worcester’s fate falls on Mattie’s shoulders. The four days following Victoria Day Weekend marks Aboriginal Awareness Week across our great Nation. It was first conceived in 1992 to raise the level of awareness of Aboriginal peoples within Canada and has grown into a week to honour Aboriginal cultures in Canada, including the Métis, the Inuit and First Nations. While we celebrate and showcase our identities on National Aboriginal Day in June, this week affords us a broader opportunity to reflect on the contributions Aboriginal people have made to the Canadian Mosaic. Click Here to continue reading. The Government of Canada is partnering with Aboriginal Communities to provide necessary resources for Aboriginal youth to succeed in the job market and build a bright future for themselves and their families. Under the Aboriginal Skills and Employment Training Strategy (ASETS), Aboriginal agreement holders determine the type of youth programs to deliver based on the needs of the Aboriginal youth who are being served. Qalipu Mi’kmaq First Nation is an ASETS agreement holder and has an ASETS Youth Program that provides aboriginal youth an opportunity to gain employment during the summer months with local employers in their own communities. The College of the North Atlantic’s Visual Arts Faculty at Bay St. George Campus are offering two (1) week Aboriginal Art Institutes. Both institutes will introduce the student to the form and function of traditional and contemporary aboriginal art practice through interaction with guest artists and specialized instructors. The Qalipu Mi’kmaq First Nation and the RCMP are working together to build a worthwhile work experience for those aboriginal youth who are interested in the RCMP program. This job opportunity will give you an insightful look at the RCMP and may help you decide if this is a career opportunity you wish to pursue. The Qalipu Mi’kmaq First Nation Band (MAMKA program) has one non-core fishing designation available for the 4R area. This license includes Lobster (LFA 13A), Bait, and Herring. Fishing vessel, equipment, and traps will be the responsibility of the selected applicant to supply. Members of Qalipu Mi’Kmaq First Nations Band living within the region are encouraged to apply by submitting a letter of interest, with their band number, and outline of their experience by 12pm (noon) on April 12th, 2013. All qualified applicants will be entered into a draw for license designation which will be conducted in the presence of two councillors from the region. Please drop off or mail applications to MAMKA, 3 Church Street, Corner Brook, NL, A2H 2Z4. Following the close of nominations on Friday February 22, 2013 at 4:00 pm only one nomination was received for the position of councilor for the Gander Bay Ward. Therefore nominee Calvin Francis was declared elected for the position of councilor. Click here for the Election Results Press Release. As per section 6.5.2 of the Agreement for the recognition of the Qalipu Mi’kmaq First Nation (QMFN) and inclusive of the amendment to the Agreement noted as the accelerated process an election must be called by September 22, 2012 and held by March 22, 2013. Therefore; we are asking all members of QMFN to visit www.qalipu.ca and update member information into the GINU membership database. Remember, use the Already logged in section if you have previously logged in. For members who have not logged in before you must enter a zero in front of your band registration number. Please provide current email address, street address and mailing address. For many people, the street address will determine on which voters list their name will be placed. As you may be aware QMFN has incorporated a mail in ballot option for the election process and without the correct mailing address we will not be able to provide you with this feature. Qalipu can also notify members of an election date through an email if members have registered an email address in the GINU membership database. It is critically important that you continuously manage your own member profiles on our database. I urge you to actively keep your information up to date. As you can imagine with such a large membership, we need you to take responsibility for making sure your information is up to date in order for us to maintain communications with you. We would like to congratulate CEO Annie Randell and Chief Brendan Sheppard on receiving the Deputy Ministers’ Recognition Award for Collaboration/Partnerships. In keeping with the accelerated process an amendment to the Order in Council took place on March 29, 2012. This amendment included 1514 applications which were in the system prior to November 2009. Approval letters for this number of applicants will be sent out from Aboriginal Affairs and Northern Development Canada (AANDC) soon. A fourth batch of 921 applications which were also in the system prior to November 2009 was submitted for approval by AANDC on March 23, 2012 for inclusion on the Qalipu Mi’kmaq First Nation founders list. These 921 applications are yet to be approved by an Order in Council. All other applications submitted after November 30, 2009 will be submitted for inclusion to the founders list after the independent enrolment committee has completed all of their review and other necessary work as specified in the agreement which will be sometime in 2013. Letters from the independent chair Mr. Tom Rideout will continue to go out to applicants periodically. It is critically important that you continuously manage your own member profiles on our database. I urge you to actively keep your information up to date. As of now, we have more than 16,000 registered members over the age of 18 (of the almost 22,000 members in total); it is quite possible that this number will almost double in the next few years. As you can imagine with this large membership we need you to take responsibility for making sure your information is up to date in order for us to maintain communications with you. Our new website will keep you informed about our programs and services. Through the website you can now access your individual member files. Please click on the “Update Member Information” button and follow the instructions. The Qalipu Mi’kmaq First Nation Band is hosting a one day Elder Traditional Teachings Symposium for the Central Newfoundland Membership on Wednesday, December 10 from 8:30 – 4:30 at the Mount Peyton Hotel in Grand Falls. This Symposium will focus on sharing and documenting of knowledge, reinforcing culture networks, promotion of leadership and mentoring of youth within their respective communities and the promotion of volunteering. The Symposium will assist participants with: The learning of basic Traditional Teachings and the development of future Cultural Circles and resources. Seating is limited, snacks and lunch will be included. A travel subsidy is also available. Please provide your name, address, phone number, and a short explanation as to why this symposium interests you. Please inform us of any allergies or medical conditions. Please contact Michelle Matthews, Cultural Researcher, by email at mmatthews@qalipu.ca or by phone, 709-634-0996 extension 227. October 5 to 11 is Mental Illness Awareness Week. Qalipu Mi’kmaq First Nation Band, St. Georges Indian Band and Western Health will be hosting a community workshop on suicide prevention and awareness “Supporting Your Family and Friends.” Guest speakers and Cultural Elders will focus on cultural learning and supports within the community that can help support suicide prevention. This event is scheduled for October 8th, 2014 at 7pm in K’Taqmkuk Mi’kmaw Cultural Historic Museum – St. George’s, Newfoundland. On Tuesday September 30th, 2014 in Stephenville, NL Emera Newfoundland & Labrador will be hosting Supplier Information Sessions with afternoon breakout sessions for self-identified under-represented groups. Click here for Session information and on how to register. Every Thursday until September 25th, the Qalipu Mi’kmaq First Nation Band will be sponsoring barbeques on the Majestic Lawn from 11:45 until 1:00, weather permitting. All proceeds from the barbeques will be donated to our staff charity of choice. This year, we have chosen the Janeway. CBAWA is organizing the Mass for the Feast of St. Anne – Patron Saint of the Aboriginal People on Saturday, July 26, 2014 at the Holy Redeemer Cathedral, Mount Bernard Avenue, Corner Brook, starting at 5:00 p.m. Bishop Peter Hundt will be the presider and Father Edward Terry will be the homilist. Weather permitting there will be a smudge at 4:30 p.m. prior to Mass. This event is open to the public. Featuring artwork by Marcus Gosse. The purpose of this art exhibition titled, “Mi’kmaq Utopia”, displays themes of peace, friendship, family, harmony, love, joy, sharing, and tranquility within “Mi’kma’ki”, or, the Mi’kmaq Territory( places where the Mi’kmaq have lived in large concentrations-Newfoundland, Nova Scotia, New Brunswick, Prince Edward Island, Quebec, and Maine). Saturday, June 21st is National Aboriginal Day. You are invited to participate and celebrate at Margaret Bowater Park in Corner Brook from 6 am to 2pm. This is a special day to celebrate the unique heritage, diverse cultures and outstanding achievements of First Nations, Inuit and Métis peoples across Canada. All are welcome. Please click here for the schedule of events. Saturday, June 21st is National Aboriginal Day. You are invited to Qalipu Mi’kmaq Band’s Official Aboriginal Day celebrations on June 21, 2014 in St. George’s. This is a special day to celebrate the unique heritage, diverse cultures and outstanding achievements of First Nations, Inuit and Métis peoples across Canada. All are welcome. Please Click Here for the schedule of events. The Qalipu Mi’kmaq First Nation is hosting a two-day Business Forum in Gander, NL that will take place on March 19th and 20th at the Albatross Hotel. This year’s event theme will be Funding Opportunities and Procurement Strategies for Aboriginal Entrepreneurs. Guest Speakers and Panelists will include procurement experts from the Lower Churchill Hydroelectric Generation Project, the Maritime Link Project, the Hebron Project, as well as an expert on Aboriginal Business Certification. View the Program Agenda here. We are pleased to offer Free Registration, however space is limited. You can register online at http://qalipu.ca/mawiomi-2014/ or by calling Nicole Companion at (709) 634-8043. Are you a student belonging to a First Nations/Inuit/Metis community? Are you thinking about medicine as a possible career choice? If so, this event may be of interest to you. The Aboriginal Health Initiative of Memorial University’s Faculty of Medicine will be hosting our fifth Pre-Med Orientation session on Saturday, February 1, 2014. The event will take place on the St. John’s campus at the Bruneau Centre for Innovation and Research. Details for the day are in the agenda. If you are interested in participating or looking for more information about the Aboriginal Health Initiative, please contact Dr. Carolyn Sturge Sparkes, AHI Program Co-ordinator, by e-mail: carolyn.sturge @med.mun.ca or calling (709) 777-2452. The deadline for registering for the February 1st session is Friday, January 24th. Click here for Event Agenda. Are you an Aboriginal student? Are you interested in becoming a teacher? Every Thursday from July 4th – August 29th, the Qalipu Mi’kmaq First Nation Band will be sponsoring barbeques on the Majestic Lawn from 11:45 until 1:15, weather permitting. All proceeds from the barbeques will be donated to our staff charity of choice. This year, we have chosen the Canadian Diabetes Association. The Qalipu Mi’kmaq First Nation is holding member consultations in the west coast region to talk about the Muskrat Falls Hydroelectric project and related Maritime Link project. The Band needs to hear from members about possible business and employment benefits, as well as environmental and traditional land use concerns. Every Band member is encouraged to attend. On Tuesday April 9, 2013 the Gander Bay Indian Band Council will hold an Annual General Meeting for its membership. For more information click here. Please take notice that on April 4, 2013 the Sple’tk First Nation (SFN) will be holding an Annual General Assembly for its membership. For more information click here. Councillor Brendan Mitchell will be holding a Town Hall meeting for the Corner Brook Ward on January 29th from 7:00pm-9:00pm at the Pepsi Center in Meeting Room #2. Enter at Box Office entrance. The Assembly of First Nations (AFN) invites First Nation students – grade school and high school – to participate in a video contest telling us about your school. Aboriginal Day Celebrations took place in Corner Brook on June 21, 2012 in recognition of National Aboriginal Day. The Great Creator blessed the first annual Qalipu Aboriginal Day Celebration with absolutely beautiful weather. It was very encouraging to see so many people attend the day long celebrations and we do hope that the people who attended enjoyed the day as much as Qalipu representatives enjoyed the day. We have attached a photo gallery of some of the day events. Qalipu Mi’kmaq First Nation Band has formed a Cultural Committee and that Committee is committed to holding at least one National Aboriginal Day Celebration in the major regions on the island where we have members residing. We are optimistic that members in each region would like to be part of the Cultural Committee and help support ongoing National Aboriginal Day Celebrations in all regions. Qalipu Mi’kmaq First Nation (QMFN) is seeking input from members on the development of a Tourism policy. Click here for more information.